The Oxford Dictionaries defines the phrase as “smartly dressed”, but James Bond is literally “suited and booted” on many occasions when he pairs an elegant pair of boots with a suit. Boots with suits are a fashion that that many shy away from, often because they think boots are inappropriate or not formal enough with suits. The height of one’s footwear ultimately has less of an importance when determining what it can be worn with than other factors have. 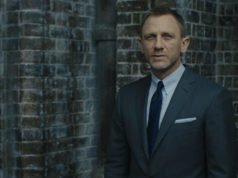 James Bond occasionally wears boots with suits, following a long history of what many people now think is an unconventional style. Boots are more commonly accepted with sports coats, and for that reason this article is focused on boots with suits rather than boots with suits and sports coats. Before the oxford shoe became the standard for formal menswear in the early 20th century, men commonly wore boots with lounge suits and more formal manners of dress. The phrase “suited and booted” comes from this era, when a man had to wear boots to be smartly dressed. A popular style was the balmoral boot, which had closed-lacing like an oxford. The boot has a seam that runs parallel to the ground that divides the shoe into upper and lower halves. The upper half includes the lacing while the bottom half includes the toe, heel and everything between. Though the balmoral boot is a lace-up boot, older but similar styles include boots that fasten with buttons or snaps/poppers instead of laces. James Bond does not wear these formal, old-fashioned boot styles with his suits. 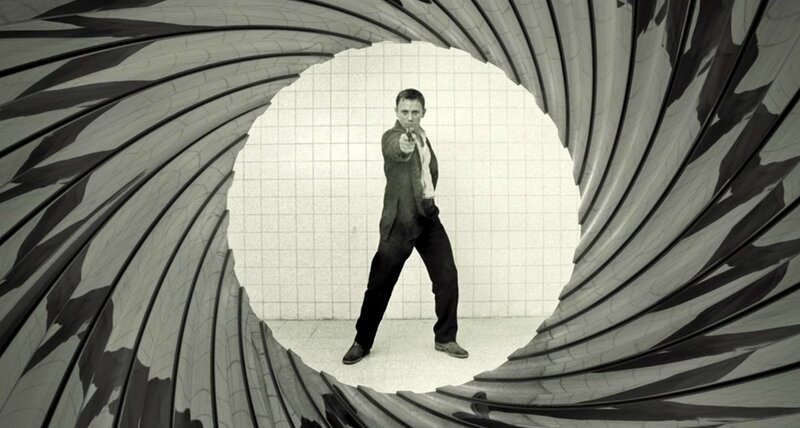 When James Bond started wearing boots with his suits in the 1960s, he wears styles that originated as sporty boots. These sporty styles are transformed into more formal designs with sleek and elegant lasts, dressy toe styles, 270° welting and slim soles. When the top of a dressy boot is covered by one’s trousers when standing, a dress boot looks almost the same as a more ordinary dress shoe. The boot saw a revival with suits in the 1960s, when James Bond first wears boots with his suits. This trend to wear boots with suits coincided with the return of narrow trouser legs, and the two work perfectly with each other. Narrow trousers must be hemmed shorter than wider trousers because the trousers meet the shoe at a narrower and higher place on the shoe. If narrow trousers need to be hemmed shorter than wider trousers so they don’t have a sloppy break, and wider trousers need to be hemmed longer than shorter trousers so the hem isn’t floating above the shoe. Because narrow trousers are hemmed shorter, socks will often show with narrow trousers when wearing shoes. To combat socks showing, boots became popular to bridge the gap. James Bond first wears boots with his suits in Goldfinger in 1964. The popular style of boot at the time was the Chelsea boot, a tall ankle boot with elastic panels on the sides to allow the foot to fit though. It’s a variation on the Jodhpur boot, an equestrian boot that fastens with a strap and buckle. James Bond’s elastic boots in the 1960s are shorter than the Chelsea boot. While the Chelsea extends a few inches above the ankle, the tops of Bond’s ankle boots sit just at the top of the ankle joint like a shorter chukka boot does. A boot of their height is sometimes called a “bootie”. The lower height makes the boot easy to get on and off quickly, since Bond may need to put on or remove his boots at a moment’s notice. 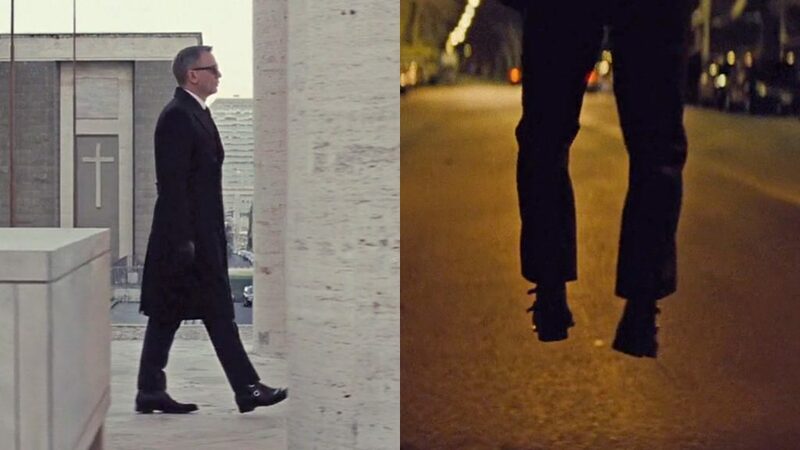 The elastic bootie is an update of the black casual shoes/moccasins (loafers) that Bond’s creator Ian Fleming specified the character to wear in his novels. 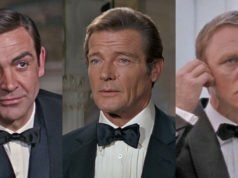 In the On Her Majesty’s Secret Service novel, it is mentioned that Bond “abhorred shoe-laces”, hence why he wears casual shoes with his dark blue suits. The elastic bootie may not be a moccasin, but it avoids the laces that the original Bond did not like. 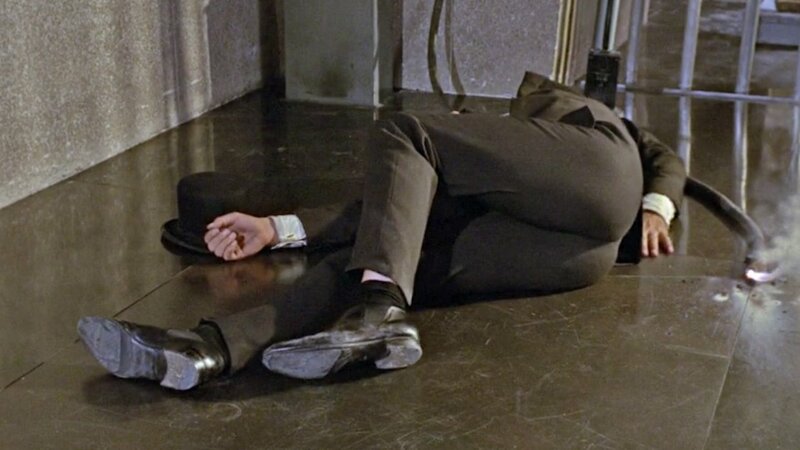 Bond’s black elastic booties in Goldfinger are like short Chelsea boots in that they have elastic panels on the sides. The booties are made of two pieces: one over the toe and vamp and another that makes up the quarters and sits overs the instep. He wears these booties with his dark brown striped suit at Fort Knox as well as with his black sneaking-around outfit when he ends up on the laser table. With his suits in Thunderball, Bond wears a style of bootie made of three pieces: one on the toe and vamp and two for the two quarters on each side. The vamp sits on top of the quarters and is connected under the vamp and across the instep with a piece of elastic. This type of bootie conceals the elastic for an elegant look. The black boot in Thunderball has a plain toe. The chukka boot is one of the most versatile styles of boots, which originated for the game of polo. It is an ankle-height boot, with height ranging from the top to the ankle to an inch or two higher, but it is shorter than Chelsea and Jodhpur boots. It has derby-style open lacing and laces up with two or three pairs of eyelets. 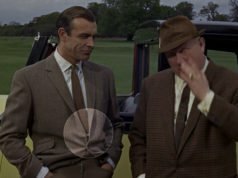 The first time Bond wears chukka boots with a suit is in Casino Royale, and they’re worn with a sporty navy linen suit to a cricket match, a most fitting setting for chukka boots. 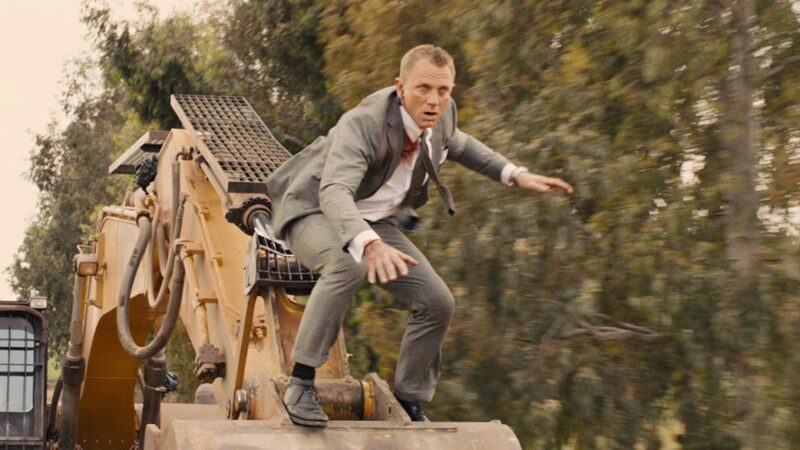 The scenes outside at the cricket match were cut from the final film, with only the scene in the outfit being Bond’s first kill in the toilet. These boots are made of snuff (light brown) suede. 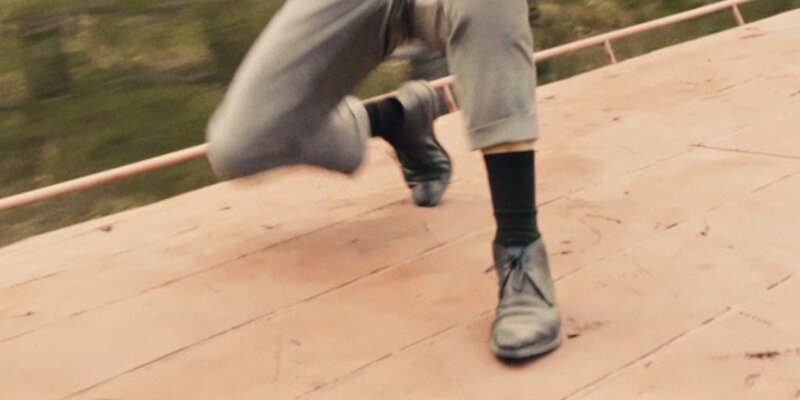 At the end of Casino Royale with his striped navy three-piece suit, Bond wears black calf two-eyelet chukka boots in the “Romsey” model from John Lobb. When hidden under the suit trousers, these boots are hardly different from elegant two-eyelet derby shoes. Chukka boots return with a grey pick-and-pick (sharkskin) suit at the start of Skyfall to give his feet and ankles more support than his regular shoes. Bond wears black calf chukka boots in the “Tetbury” model from Crockett & Jones. These boots are made on an elegant chiselled last with Dainite studded rubber soles and could be mistaken for derby shoes when the trousers are covering the top of boots. Though chukka boots are a step in formality below derby shoes, they look the part with the dressy grey suit because of the last, the soles and the colour. Polished black calf can help a less-formal-than-ideal style of footwear look more appropriate with a suit. Like the elastic boot, the strap boot avoids the laces that the literary Bond abhorred but provides a more secure means of fastening than elastic. Bond’s first strap boots appeared in Diamonds Are Forever, when he wears a boot that resembles a chukka boot but secures with a strap instead of laces. This boot is made by John Lobb Ltd. of St. James’s, London and resembles a chukka boot but has a strap instead of lacing. Lobb calls this a “Strap Hilo Boot”, while “Hilo Boot” is their name for a chukka boot. The height of this boot is just above the ankle. 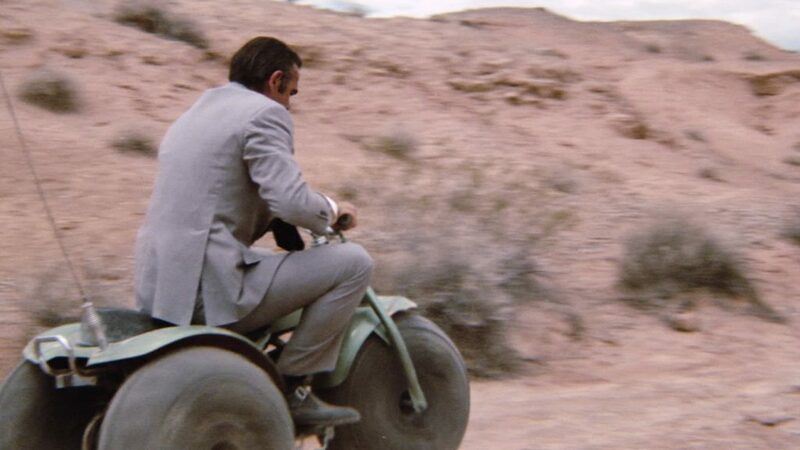 Connery wears this strap chukka boot in black suede with his light grey suit when riding a dirt bike and in chestnut brown calf with his cream linen and silk suit and pink tie for his encounter with Bambi and Thumper. This is the sportiest boot that Bond has worn with a suit and is better suited for the cream suit than it is for the grey suit. Connery also wears the brown boots with his brown checked tweed jacket that he also wears in Diamonds Are Forever, where the boots are most at home. In Spectre, Bond wears the Crockett & Jones “Camberley” double monk-strap boots with a black herringbone three-piece suit to a funeral in Rome. The boot is part of a disguise so Bond can fit in amongst Italian gangsters, and though the boot is flashy its style is thoroughly British. This boot fastens like a monk shoe, with straps extending from the inner quarter that fasten to buckles attached to the outer quarter over the front of the shoe. Both quarters sit over the vamp and tongue. This differs from the sportier Jodhpur boot, where the vamp lies over the quarters and a strap loops around the back of the shoe. This boot is shorter than a Jodhpur boot and around the height of a taller chukka boot. Bond’s double-monk boot looks just like an elegant monk shoe when it is hidden under the trousers due to its elegant chiselled last and slim Dainite sole. This article came out in appropriate time. It comforts me in the way I dressed this morning; black slim fit suit, white pin collar shirt and a pair of black suede chukka boots. Nice Matt. Limited in scope, but interesting. However, Aren’t Connery’s boots technically monk-strap boots as well? Yes, they are a cross between monk shoes and chukka boots. It may not be the same, but what do you think? This style was used for You Only Live Twice, and it’s a shorter version of the Thunderball boot. Many English shoemakers make this style of shoe, and I have seen examples from Edward Green and Alfred Sargent. Lobb can make anything they want to make, and they may have made the Thunderball boots too. They likely made shoes and boots for many of Connery’s Bond films. I haven’t worn shoes in years. I have two pairs of derby boots, in black and brown, which are for all intents and purposes identical to normal shoes but that they rise up and cover the ankle instead of dipping beneath them, similar to Sean Connery’s. I got so used to them that if I ever try wearing shoes now I get terrible blisters, where I never have that problem with boots. It’s refreshing to finally hear someone say it’s appropriate, I get tired of the naysayers constantly telling me off. Wearing a boots with a suit is like wearing a belt with braces. Not my style as at all, but the question is did i ever have style to begin with? How is it like belt and braces? A suit does not perform the same job as footwear so I don’t really see the connection here—”belt and braces” means to have a back up, over kill. I must agree with martin, I don’t feel it is comparable at all. As Matt demonstrated, the boots look like normal shoes when the trouser leg isn’t pulled up since they have a more elegant last. In my opnion, that’s the important reason to wear boots with current suits: currently, trousers opening become narrower (too narrow to surround your shoes like before). Therefore, trousers must become shorter (no break or slight break), or else the traditionnal trousers break would become an ugly pile of fabric (instead of a nice line/tube). But it can make a problem when you sit down (if you want to observe the traditionnal reserve to show your socks). And consequenly, you have to make a choice: either, wearing nice and proper socks (making them an openly admitted accessory), or wearing boots. With boots, the appearance of your legs will be appropriate, both standing up (then, boots look like normal dressed shoes) AND sit down. Besides I find that it’s a good choice for men looking for dynamic shoes (after having been used to wear sneakers until their entry in the professional world for example). According to my reasoning, you can also corollary conclude that, if you want to wear “normal” dress shoes, you would rather wear larger trousers than current trend. In my opinion, it looks like very old fashionned but, here, it is a matter of taste. Sean Connery’s simple elastic boots are a good example in favour of this concept. That’s not what “belt and braces” means, saul. The phrase is used to indicate something that is superfluous. Boots are not. They fulfill the same function as shoes. Better, in some respects. Thank you for your cander. However I disagree with your stance. Boots with a suit remind of a person who thinks it’s a good idea but in reality it’s not. Perhaps I’m biased, or I’m stuck in a certain time zone. That being said many of the scenes where the boots are worn i did not really care for to begin with . For instance, I never thought craig was a good bond and I still don’t. The film diamonds are forever was truly of connerys forgettable films of the entire series. Suede boots with a buckle???? saul, it’s clear to me at this point you still don’t know what the phrase means and were just using it to sound cool. “Belt and braces” would be wearing a Tie Thing and metal tie bar together. By fulfilling the same function as shoes or better, I was purely talking functionality. Boots offer ankle support, shoes offer none. One can see why they would use dress boots in certain action scenes due to that fact. The fact remains, regardless of your stance on them, that dress boots were standard with suits once upon a time and that many still wear them. As an example, they can give extra warmth and protection against snow during winter. You don’t have to agree with the practice, but none of what you are offering so far is a very good defence against wearing boots with suits. Especially elegant dress boots that look just as sleek or minimalist as many dress shoes do with the trouser leg covering the shaft. Regarding film or acting quality, it frankly has nothing to do with this discussion. I imagine they’d be quite useful for a man of action like Bond or Steed. Nice purchases! Wish I had the money for some. ($650 a pair, ouch.) I think that was a pretty fair compromise to make. Maybe it’s Casino Royale, but I actually like the look of two-eyelet derbys with a dinner suit. Shop the sales my friend! Selfridge’s, Barney’s, those types of higher end department stores mark them down from time to time, as do online merchants like Farfetch. I like plain derbies with a dinner suit too, I usually wear the Crockett and Jones Aintree with black tie. I agree with saul, to me boots have a place, by why screw up a 5,000 tom ford suit with a pair boots? Although fairly conventional in my clothing habits, I sometimes indulge in the the combination of suits and chelsea boots during winter time. Both have leather soles. Brown suede with grey suits, and black leather with blue suits. Not a fan of black suede, not of the Thunderball short boots. As for the suitability of such a combination, I live very well with it. Apart from the Avengers’s John Steed, I remember a scene in Marathon Man, where Roy Scheider is very sharply dressed, and is wearing rather high ankle boots. If I find it I will post it. That sounds good. I agree with you about the Thunderball boots, they haven’t dated that well IMO. During winter I would personally wear Dainite soles to hold up better against snow and salt. There are times when boots with a suit are entirely functional and appropriate, and still sharp. New York City recently had a terrible cold snap. One morning it was only 9 degrees, with a wind chill of 1 degree, and I wore dress chukka boots with my suit. On rainy day’s it makes complete sense to pair Chelsea boots with a suit. If a boot is designed like a dress shoe, it doesn’t ruin the line of a suit at all. On days where the streets are plagued with salt and slush, I’ve even tucked my suit trousers into my Crockett and Jones Islay boots. Holding onto preconceptions that suits should only be worn with dress shoes like oxfords and derbies reminds me of the comical pictures that the New York Times photographer, Bill Cunningham, used to take of absurd men wearing dress shoes trying to get over vast moats of slush and rain at New York City street corners. once more into the breach dear friends? Well, dress boots are not going to be the same thing as combat boots or desert boots. (Though I’m sure GQ has espoused those two with suits at some time or another, just as they did motorcycle boots in 2005. Blech.) To paraphrase the love of Bond’s life, there are chukka boots and there are chukka boots. Ones that have the same type of elegant last as a good English dress shoe will look just fine, as MN says above. At one time nobody questioned the validity of boots with a suit (or morning coat, or frock coat before that). It was probably due to the gravel roads of the time and wanting to protect the ankles from having bits fall in. Though we now have paved roads and sidewalks, they still offer greater ankle support for walking around all day. Plus the weather angle, as you put it. Remember that what we think of as equestrian boots like jodhpurs and Chelseas were originally walking boots descended from formal walking button boots. I see a few affluent igents with large shoe selections diving into their laced up dress boots during winter and I wonder if they really have a noticeable utility above shoes. They may seem to keep your ankles dry but unless you tuck the bottoms of your strides in they’re still going to get wet aren’t they? I would guess a commando sole or dainite regardless of whether on a shoe or a boot, would be the most useful substitute for more formal business shoes during wet and slushy winters. But what do I know, I live in Florida! I could use some ankle support when I’m dressed up and need to be on my feet a lot. I think the Crockett and Jones Deene look sharp and you can order them with a ‘City Sole’ for an extra cost. To me they look similar to Connery’s boots in Goldfinger.